*On all three images I used one layer of Kim Klassen's whitewash texture with the blending mode set to soft light. I love the changing of the leaves. Your Texture Tuesday entry is quite beautiful. Oh, I am soooo envious of all the bright red maples I am seeing around here....alas NONE in MY yard :( Nope, I don't think I will EVER get tired of seeing crimson leaves. I particularly like your last shot...the angle and dof. And I do like that whitewash texture you used...lovely. I'm with Kathy on the last photo. I really like the DOF and contrasts of color. Just beautiful Deb! I actually have lots of leaves in my backyard now. Time to get out there and start shooting. Oh my! I've never seen a leaf change quite like the first photo. Absolutely beautiful. Beautiful colours - how could anyone tire of that. I love autumn - long may the colours last that's what I say. Your pictures are beautiful as usual. Those are really pretty. I love fall leaves. Beautiful Deb, and I really love the softness in the first photo! No I will never ever tire of autumn photos . . . you have amazing dof field in these! Amazing colors from your leaves. Wonderful ! I'm not tired of leaf pictures- I'm loving them! Beautiful! Beautiful - love the last shot. I just wish it would stop raining so I could take some photos. That's such a gorgeous capture. 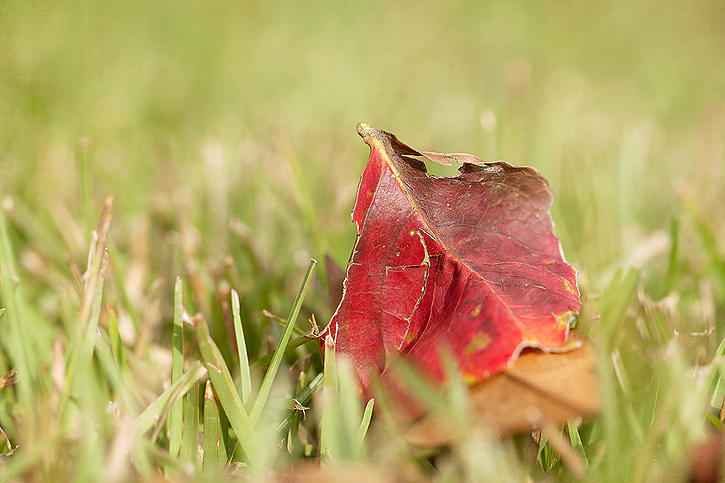 Red leaves are my favorite and you've captured them beautifully. I especially like your first image. I miss the change of seasons - most everything is green here now. Spring is when we really shine! Your work is so beautiful. I always look forward to visiting your blog. 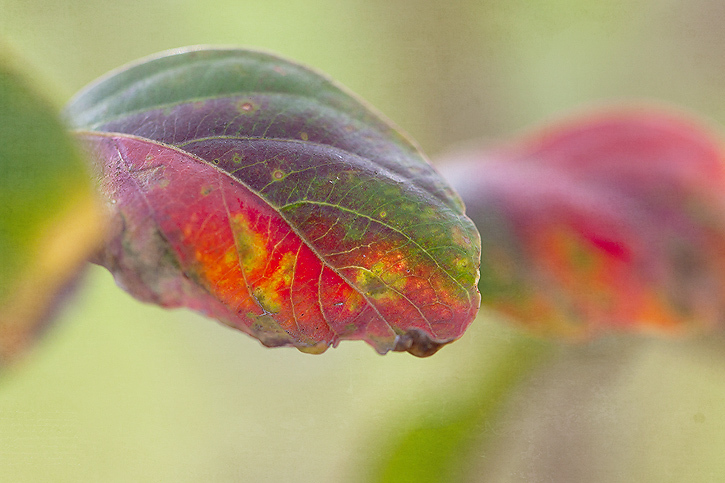 Nice photos with exceptional color these leaves, deliciously autumnal. These are so beautiful. I just love the color and the focus particularly the first one. I'll have to watch the tutorial later today. Gorgeous! And I love the texture. I'm so much farther north than you and nearly nothing has changed here! great photos though !! You captured some beautiful colour here! LOVE. LOVE. LOVE. Gorgeous color! I don't think I'll ever get tired of Fall photos. These are beautiful! The colors are just now changing here. I've been like a kid waiting for Christmas! Beautiful images here. Gorgeous! We are just starting to get changing colors, it is so late for us, but I'm glad it's finally here! Just gorgeous; I love the color variety in the first leaf. Love the last one...I have not done any leave shots yet, better get to it before they are all but a memory! No not yet! Especially since there really aren't many around here - us gulf coasters have to live fall through everyone else! These are faBulOUs!! Love the first and last ones! MUST get out and take photos of the leaves before they are all on the ground! Me, either! And, I love these, especially of that variation in the 1st one. God is quite the artist, huh!? Love the leaf pictures! I don't think I'll ever get tired of seeing them! Isn't that fabulous when then they just start to turn!? Great Captures Deb. Absolutely beautiful!! I love autumn! For me, nothing says autumn like changing leaves. This is a great series, lovely. Beautiful shots Deb. I love the last one, it is perfect. 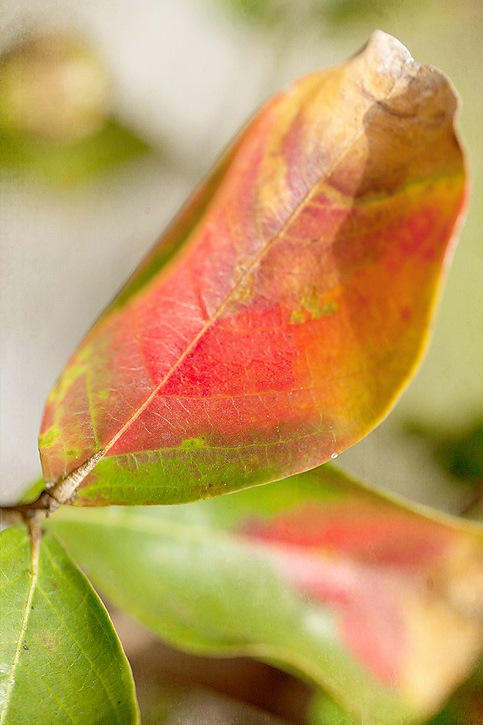 The leaves on your crepe myrtle are gorgeous! I fell in love with crepe myrtles on our first trip to the NC beaches. I found a variety that is hearty enough to survive our PA winters. I had one for two years and went out and bought another this summer. They are so beautiful! Lovely, lovely photos. I always enjoy your perspective in your photos. I glad you knew you knew the name of the orange butterfly. I searched and searched for its name and couldn't identify it. I will have to show my photos of them soon, but yours are gorgeous! You captured these beautifully. These are excellent! I too am searching for some magnificent colors and I'm coming up empty handed. Due to our crazy weather, I suspect we will be seeing a lot of yellow and brown here in central Jersey and not too much orange and red. Even so, I'm not giving up until the first snowfall - LOL!